Cllr Liz Wheatley, president of the Godalming/Mayen Association, said: “This exhibition is a shining example of the collaboration and cooperation between the three towns and shows the benefit of twinning and the friendship that exists between us. Meanwhile FROME Twinning Association in Somerset is to host a European Dinner on 24 February for guests from its twin towns of Murrhardt in Germany, Rabka-Zdroj in Poland and Chateau Gontier in France. The dinner will be held at Trinity Church and the courses will be themed around each country, with French onion soup to start, followed by German pork in gravy with red cabbage and Polish cheesecake for dessert (vegetarian options are also available). In addition, a new project led by Frome Town Council will enable young locals aged 18–25 to undertake work experience placements in Murrhardt, after a number of businesses there expressed interest in taking part. Participants will have placements lasting one to two weeks and will stay with host families in the German town. RINGWOOD Town Council in Hampshire recently hosted a delegation from twin town Pont-Audemer, in the Normandy region of France. 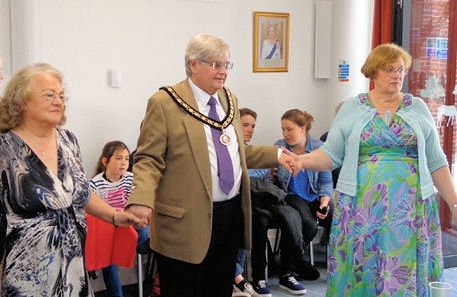 The annual event was organised by the Ringwood Twinning Association and kicked off with a reception at the council offices. The next day the guests visited National Trust property Kingston Lacy, accompanied by a procession of vintage cars from the Austin 7 Club. This was followed by refreshments and an exhibition of photographs of Pont-Audemer. Vulcan Park in WORKINGTON hosted hundreds of people on 27 May to celebrate 20 years of the Cumbrian town’s twinning with Val-de-Reuil in France. The Party in the Park was a free family event organised by the town council and featured market stalls from over 30 local businesses, street entertainers and theatre performances, live music, free face painting, children’s crafts and a funfair. A special tree planting ceremony was held during the event to commemorate the 20th anniversary of the twinning, and the French delegation also attended the mayor-making ceremony the previous evening. Val-de-Reuil is a commune in the Eure department of Normandy and has active twinning links with communities in several other countries. BEAMINSTER in Dorset welcomed a party from its twin town, St James in Normandy, at the end of May for a weekend of music and local culture. The event, organised by Beaminster and District Twinning Association, saw the town crier greet the 32 visitors before a reception and welcoming speeches by the town council chairman, Cllr Chris Turner, and Cllr Rebecca Knox, leader of Dorset County Council. A twinning exhibition was staged at the town’s museum, and the group visited Buckfast Abbey before catching a steam train from Buckfastleigh to Totnes. Other activities included a skittles competition and an official dinner at the Public Hall, attended by more than 70 guests. Speeches included one by Roger Angel, chairman of the Dorset Twinning Association, and the evening concluded with an exchange of gifts. A PARTY of 27 people from the villages of CROSTON and Heskin in Lancashire travelled to their twin town of Azay-le-Rideau in the Loire Valley in May to take on their French counterparts at boules. The twinning has been going on for over 25 years and is entirely self-supporting, according to Alan Whittaker, chairman of the Croston/Azay Twinning Association and clerk to HESKIN Parish Council. The trip celebrated the 20th anniversary of the Croston and District Boules League, and was organised by chairman Peter Briggs. The itinerary included two receptions and boules tournaments against local sides, and a wine tasting. The Azay twinning committee invited 140 guests to a dinner at Cheillé, where speeches and presentations were made by the mayor of Azay and the presidents of both boules clubs. FROME Town Council recently hosted an event entitled “Switch to a Renewable Future”, which brought together local, regional and European experts on renewable energy. Part of its thematic twinning programme, it was attended by 90 delegates from twin towns in France, Germany and Poland, along with over 200 people from Frome and Somerset. The two-day event (above) covered topics such as energy efficiency, renewable energy and sustainable lifestyles, including finance, low-carbon buildings, food waste, river power and electric vehicles. The council also launched a discussion paper on how the town could become the first in the UK go fossil fuel-free by 2046. Meanwhile the council continues to support Frome Business Breakfasts, a regular networking event. Over 40 people visited Dennis Maps on the Marston Estate for an informal breakfast and a tour led by managing director Steve Burry (below). The April breakfast focused on the role of Frome Chamber of Commerce while the May meeting, to be held at Frome College, will look at the relationship between education and work and the role of apprentices. RINGWOOD Town Council recently entertained guests from twin town Pont Audemer in France, with a reception at the council offices. The annual event is organised by the French Twinning Association, which is separate from the council and other twinning groups in the town. The mayor, Cllr Michael Thierry, presented the visitors with a watercolour picture, and other guests were given branded mugs and shopping bags. IN May WALTHAM ABBEY celebrated the 20th anniversary of its twinning arrangement with Hörstel in Germany. The two towns signed a Town Twinning Charter in 1993, and the past 20 years have seen many visits and the building of great friendships. A weekend of celebrations saw 74 German visitors attend a special church service with music by Tallis and Brahms and a sermon in German by the Rev Rod Reid. This was followed by a town hall ceremony where the mayor, Cllr Elizabeth Webster, and Heinz Hüppe, Bürgermeister of Hörstel, signed a charter reaffirming the partnership. Cllr Webster said: “I am delighted to celebrate this anniversary with our German friends and we look forward to another 20 years of friendship between our two towns.” Herr Hüppe presented the town council with a sculpture depicting friendship and a carpet bearing the town crests of both councils. Earlier, Cllr Webster and Herr Hüppe hoisted a flag to mark the launch of the town’s Festival Season. The Festival of Flags will continue throughout the summer, and there will be a food festival and an Italian market. The German group continued their visit with sightseeing in London and Brighton, including tea at the Houses of Parliament. LUDLOW’S French Twinning Association welcomed 40 visitors from the town of La Ferté-Macé in Normandy at the end of May, to celebrate 25 years of twinning. The guests were welcomed by civic leaders, and treated to a variety of social and cultural events. Town twinning has a tradition stretching back more than a century, with Keighley being the first British town to forge a “sister cities” link with Suresnes and Puteaux in France, in 1905. The practice really took off after the Second World War. However, according to a recent BBC News Magazine report, more and more British towns are scrapping their twinning arrangements. Among them are BISHOP’S STORTFORD, which has ended support for its 46-year links with Friedberg and Villiers sur Marne. Council leader John Wyllie remarked that the practice “didn’t have as much relevance in today’s society”. OFFICIALS and dignitaries from Cwmbran’s twin town of Bruchsal in Germany visited the Welsh town in early August as part of a twinning association that began in 1979. CWMBRAN Community Council laid on a full programme of activities for its guests, including visits to local attractions such as Greenmeadow Community Farm, the Congress Theatre and the Big Pit. Members of the delegation also visited local play schemes, schools and a youth centre during their five-day visit, and were treated to a brass band concert and fish and chips. WITH reference to your article in the July issue, “Is twinning out of fashion?”, I should like to report that there is a corner of DONCASTER where twinning is alive and well, despite the remarks made by Doncaster’s elected mayor, Peter Davies, who describes twinning, amongst other things, as being “about junkets”. Our Association is twinned with the town of Merksplas in Belgium. The link was formed because a soldier born in our area who fought to liberate the town was killed in Merksplas during World War II and was awarded a posthumous VC. We were officially “twinned” in 2010, although we started to correspond before this date. Since the start, our local brass band has been over on two occasions to give concerts, a local primary school has formed links with schools in Merksplas and regular contact is made through Skype, and exchange visits between teachers have been held. We were also invited to the 65th anniversary of the town’s liberation. As part of the Queen’s Jubilee celebrations we have recently hosted approximately 50 people from Merksplas, including 23 young people between the ages of 13 and 15, who were entertained by our local Academy and enjoyed activities at the local Water Park. In the future, we are hoping that our local theatre group will form links and will perform in Merksplas, and other links are being planned. We are very conscious that local people may regard twinning as a “junket”, which is why all the costs of hosting our friends from Merksplas are met by fundraising. All the costs of our Association members are met by ourselves and none of these costs come from the fundraising or from the public purse. To answer Mr Davies: no, we don’t make any difference to the local economy, but we have made many friendships and have learned a great deal about another country’s culture – and long may it continue. CWMBRAN Community Council has a long-established twinning arrangement with Bruchsal in Germany. It has remained strong since its inception in 1979. We will be welcoming a delegation from Bruchsal to South Wales again this summer for a series of events which, in keeping with the current focus on “collaboration” across Welsh local government, have been planned in partnership with neighbouring community councils. As part of the visit, we will be seeking the views of stakeholders on how best to take forward our twinning venture in the light of funding pressures and other changes since the partnership was first formed. We will examine the potential to embrace IT solutions to build on our success to date, ensuring that the arrangement continues to add value in Cwmbran. Other potential ways forward might include focusing future twinning arrangements on particular groups, such as young people. I would be very interested to hear about the experiences of other councils. PENRYN Town Council has awarded nearly £1,500 to local causes under S137 grant rules. Shelter Cornwall received £500 and the town’s twinning association got £300 to promote Penryn abroad and to host visitors from Audierne in Brittany. Other beneficiaries included the town’s arts and community theatre groups, the Lions Club and the Penryn May Day Society. FROME welcomed 118 guests from its twin towns of Château-Gontier in France, Murrhardt in Germany and Rabka-Zdrój in Poland for a four-day visit in late June/early July, as it staged the Annual Twinning Quadripartite. The theme of this year’s meeting was culture and Frome’s contribution included performances by bands, ballet dancers and Morris men, together with the Frome Heritage Trail, a twinning church service and artisan and flea markets. The guests, who were accommodated by 68 local host families, included a Polish folk group and there were also performances by the young winners of each town’s “Twinning’s Got Talent” competitions. 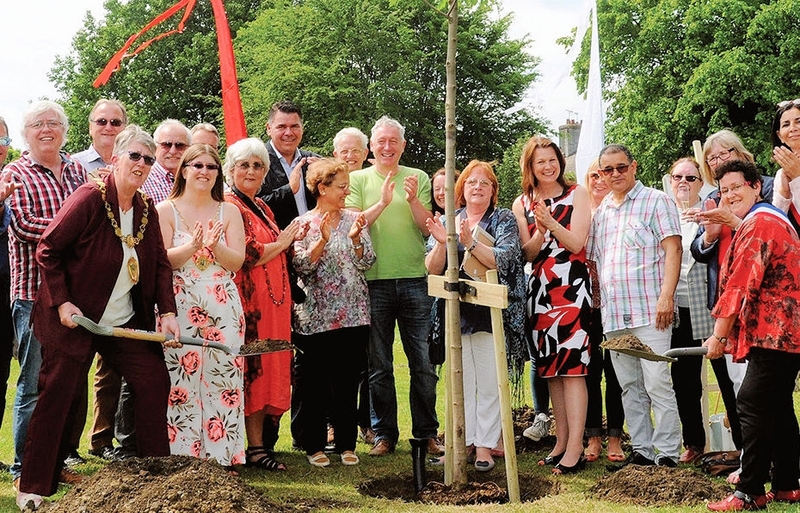 A new garden was officially opened in honour of the newest twin town of Rabka-Zdrój by the Mayor of Frome, Nick White. MEMBERS of a twinning association with links to France and Germany were nonplussed to discover that an Italian market had been booked for their twinning weekend celebrations. The DEVIZES Twinning Association welcomed 150 visitors from Mayenne in France and Waiblingen in Germany and booked a morning of theatre and music in the town’s Market Place. However, even though Devizes has never had an Italian twin town, they found that Wiltshire Council had booked in an Italian market. REPRESENTATIVES from SHREWSBURY will visit the twinned town of Zutphen in the Netherlands on 1 May in remembrance of the Second World War. The party will be led by the deputy mayor, Cllr Tony Durnell, who will attend a public remembrance ceremony on 4 May, when he will lay a wreath on the Zutphen War Monument on behalf of the citizens of Shrewsbury. During their stay, the group will visit the Airborne Museum in Arnhem, the Oosterbeek War Cemetery, the Jewish transition camp Westerbork, Harfsen village (a V1 launching base), the Old Cemetery in Zutphen, the Dutch Resistance Museum and Anne Frank’s House in Amsterdam. A party from Zutphen will visit Shrewsbury later in the year to mark the end of the First World War on November 11.